City staffers and numerous First Friday stakeholders have been meeting together regularly over the last few weeks, to ensure that March 1 will be a unique event in the history of Oakland First Fridays ... The result has been a developing working relationship that preserves the organic, community-grown spirit of Oakland First Fridays while tackling a collective responsibility to keep everyone safe at this growing Oakland mainstay." 1. Across the event, all the programming and performances will be united around themes of unity, diversity, healing and peace. 2. There will be two long moments of silence held across the entire event. 3. The event will end one hour earlier, at 9 p.m.
4. The footprint will be shortened, to take place along Telegraph Avenue from West Grand Avenue to 27th Street. 5. Public drinking of alcohol will not be allowed. Art galleries within the immediate vicinity will suspend alcohol service on March 1 as well. Specific changes in programming for March 1 include a Peace Concert and Kiante Campbell stage featuring local artists and musicians ... There will also be a “Heal the Hood” stage on 24th Street and Telegraph Avenue, featuring poets, musicians, DJs and community groups. A Solutions Salon on the topic of youth violence will be held at the New Parkway Theater from 4 to 6 p.m. In addition, there will be numerous altars and peace vigils throughout the footprint, as a token of remembrance and healing. Please note that the changes are specific to the March 1 event. 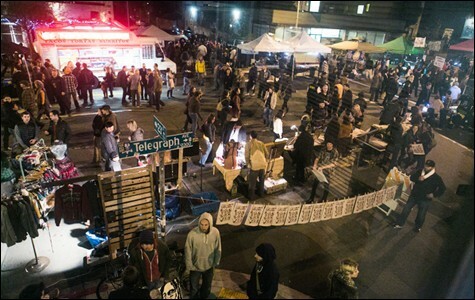 Going forward, much more change is needed to keep Oakland First Fridays safe and sustainable. Both the City and the First Fridays organization are committed to continuing the dialogue around this issue, and widening the conversation to include the greater Oakland community in working together to create solutions.